Fibre is a virtually indigestible substance that is found mainly in the outer layers of plants. Fibre is a special type of carbohydrate that passes through the human digestive system virtually unchanged, without being broken down into nutrients. Everyone hears about the need for enough fibre in the diet. But few people understand the importance of dietary fibre - or where to get it. Fibre is a useful part of slimming because it makes you feel satisfied longer because when you eat fibre the contents of your stomach are bulkier and stay there longer. 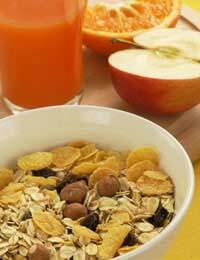 Fibre helps reduce the absorption of fat from food and drinks and can help prevent obesity. It also slows digestion and absorption so that glucose (sugar) in food enters the bloodstream more slowly, which keeps your blood sugar on a more even level. The recommended average daily allowance for fibre is between 20 and 35 grams. For example, one cup of cooked beans has about 12 grams of fibre, a slice of whole-grain bread has about 2 grams, and an apple has about 3 grams. Fibre has a host of health benefits. Diets high in fibre help the body absorb certain vitamins and minerals during the digestive process. This is accomplished when soluble fibres are broken down and become absorbed in the intestines rather than in the stomach. Soluble fibre also helps lower blood cholesterol. Sources of soluble fibre include: oats, oat bran, oatmeal, peas, beans, barley, citrus fruits and strawberries. Insoluble fibre is a critical part of normal bowel function. If you eat a diet rich in wheat cereals, wheat bran, grains such as rye, brown rice and barley; vegetables such as cabbage, beets, carrots, Brussels sprouts and turnips; and, everybody's favourite, the apple, you may never need a laxative. Which Fruits are Best for Fibre? Look for yellow or orange fruits, like cantaloupes, mangoes and oranges. While fresh fruits and vegetables are so readily available, it's an ideal time to work more of them into your diet. Add berries to your breakfast cereal. Make a fruit salad for lunch. Eat a piece of fruit for dessert. Be especially adventurous and try tropical fruits like pineapple, noni and papaya, they have a host of health benefits including, preventing indigestion, arthritis, muscle sprains inflammation, bacterial infection and cancer.